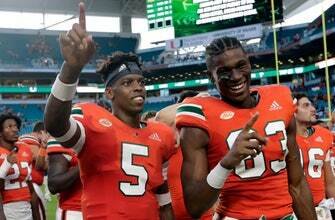 CORAL GABLES, Fla. (AP) — The last time that Miami quarterback N’Kosi Perry started a real football game was 22 months ago, back when he was still in high school. As if a short week wasn’t going to present enough challenges for the Hurricanes — who open defense of their Atlantic Coast Conference Coastal Division title at home Thursday night against North Carolina — there’s also a quarterback decision to be made. Perry completed 17 of 25 passes for 224 yards and three scores as Miami (3-1) topped FIU 31-17 on Saturday, and now seems poised to bump Malik Rosier atop the Hurricanes’ depth chart. “When the time comes, whoever I think is the best guy to give us a chance to win will be the guy,” coach Mark Richt said. That time seems to be here. Miami rose five spots to No. 16 in the AP Top 25 on Sunday, a day that’s typically a recovery one for the Hurricanes. But with a game on Thursday, Miami is in no-days-off mode: The Hurricanes’ coaches were studying film on North Carolina a couple of hours after the FIU game ended, and Richt plans four straight practice days leading up to the game against the Tar Heels. Perry will be getting first-team reps in those practices, maybe more than ever before. Rosier has started 17 consecutive games for Miami, and the Hurricanes are 13-4 in those contests (not including his 1-0 record as a pinch-hit starter in the 2015 game at Duke that ended on an eight-lateral kick return for a Miami touchdown). Even while he and plenty of other top Miami offensive players dealt with injuries last season, Rosier led Miami to its first ACC title game appearance and a berth in the Orange Bowl. But he’s never been very accurate, and that’s ultimately why he seems vulnerable now. Out of the 128 players with more than 200 pass attempts since the start of last season, only 13 have a lower completion rate than Rosier’s 53.7 percent. Perry, meanwhile, came off the bench Saturday and tied a Miami record with 14 completions in a 15-pass span. He started 10 for 10. Perry came to Miami and was considered the heir apparent to Brad Kaaya. He committed to the Hurricanes when Al Golden was coach, then decommitted when Richt was hired and eventually re-commited. Perry said Richt’s sales pitch was simple: The offense you’ll run at Miami is what can get you to the NFL. After two years of developing, Perry might be ready in Richt’s eyes to start fulfilling that vision and running his offense for real. The waiting game could be over.